We are expecting and with the upcoming birth of a newborn, I am in nesting mode. Nesting mode for me includes planning how I am going to take those adorable 0 to 12 month photos (and as I plan and look at ideas, wondering if I will give up after 3 months!) 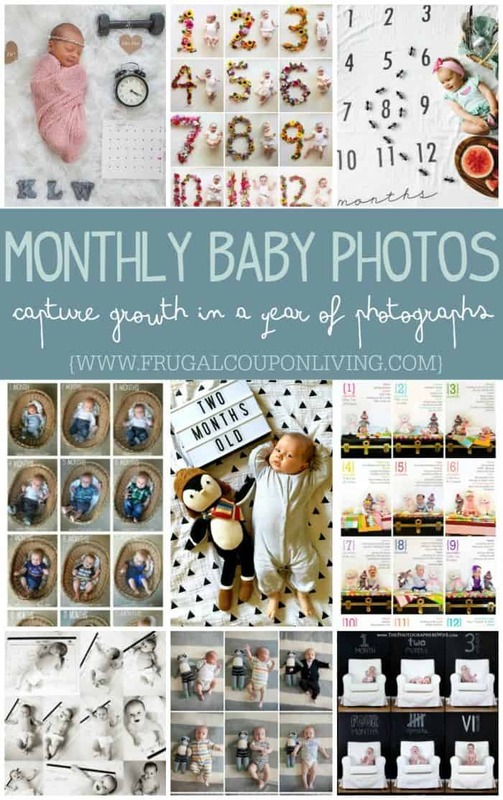 Take a look at the creative Monthly Baby Photo Ideas below. We think you might get inspired like us! 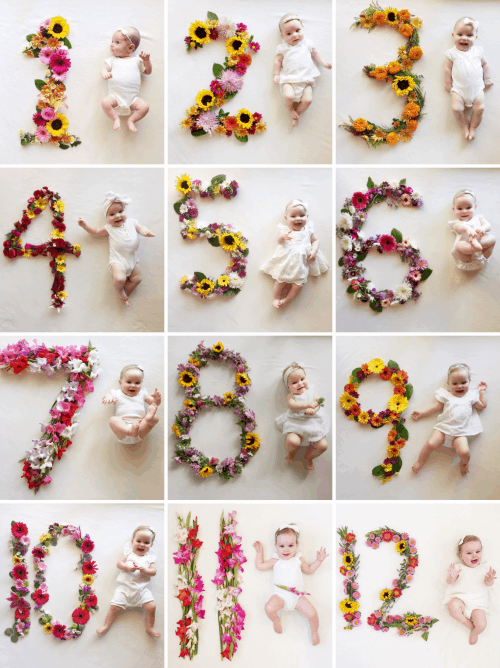 How amazing is this Monthly Birthday Floral Series from #watchavanellegrow by Lauren Bowyer. Amazon has a Lightbox which will help with these Monthly-Lightbox-Photos from Mrs. Kosakowski. I love watching the different Monthly Batzkids Blankets and creative ideas from Instagrammers and Batzkids. 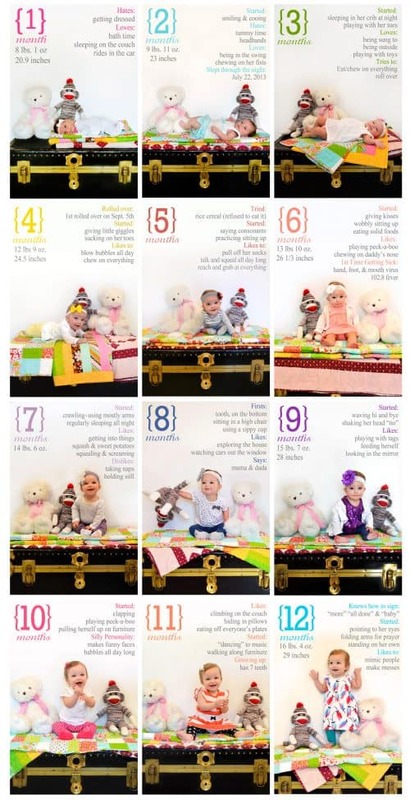 This idea from @allyouneedisliv, but you can also see what we did with our blanket and the month of November! 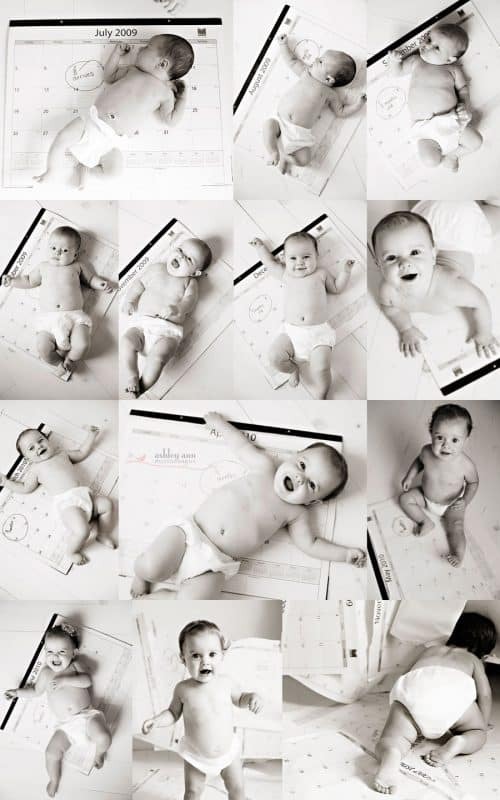 We are in love with this Belly to Baby Monthly Series from Simply Rosie. Lift Baby Up in Dad’s Arms with this Monthly Milestone Idea from Little Meg. 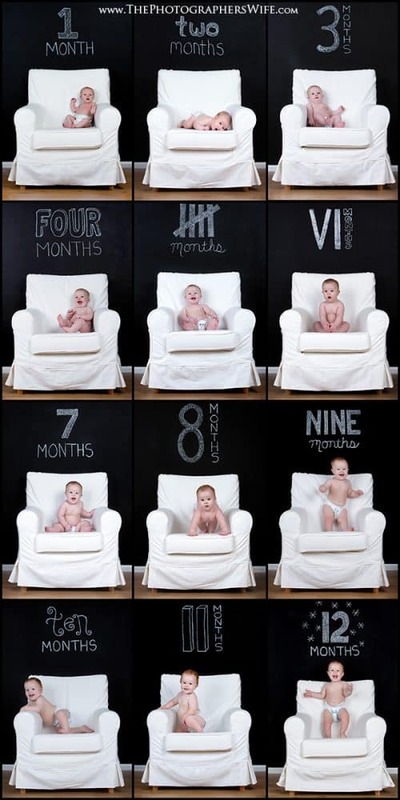 Picmonkey would be a fun place to replicate these Monthly Milestone Photos with your baby from Tonya Teran. The Photographer’s Wife did a great job using a Simplistic Chair with a Black Background and Chalkboard Font, also good with Picmonkey. 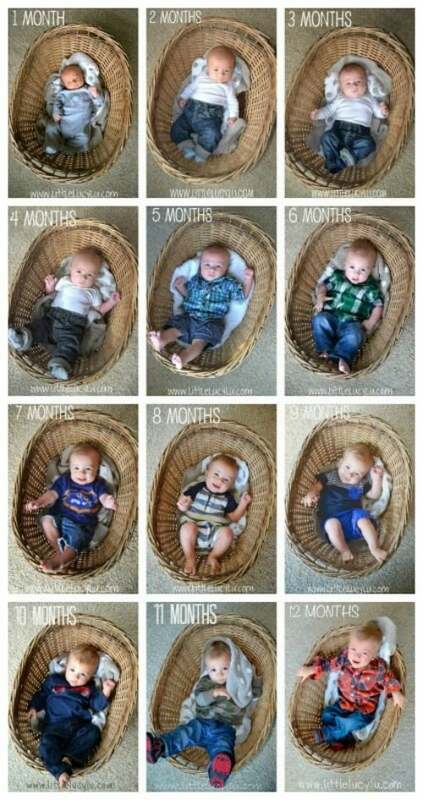 Use a Basket to Show Baby’s Growth like Little Lucy Lu. 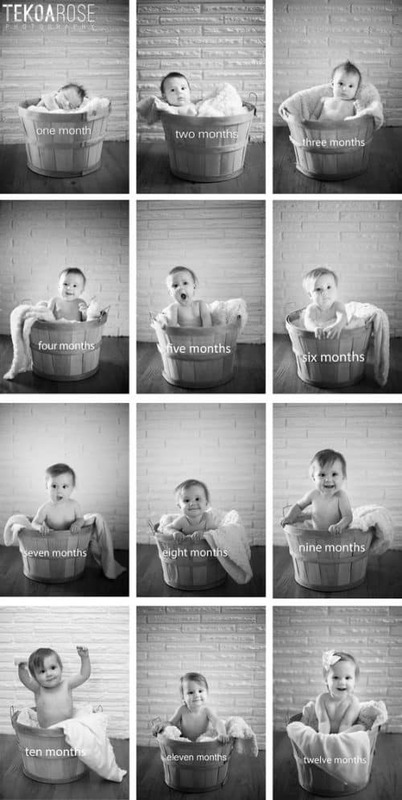 Take a basket but turn it into a Black & White Monthly Photo Memory like this idea on Tekoa Rose. Keep everything the same except the onesie! 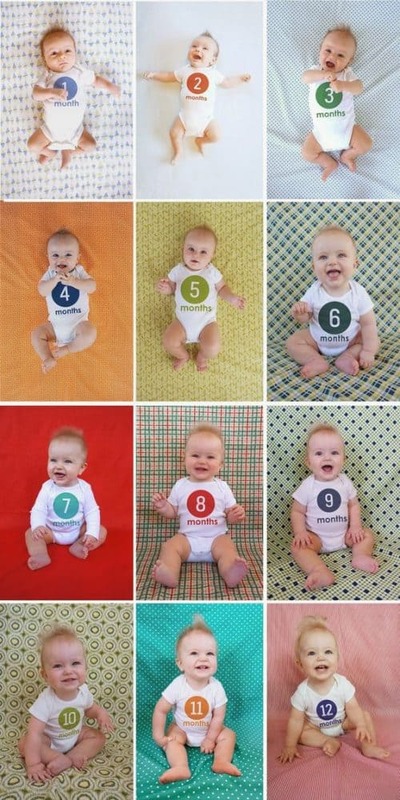 Add a number to the onesie sharing each monthly milestone like A Girl Named PJ. Focus on the background and have fun brightly colored fabric still using a number on the onesie like this idea from Laura Wifler. 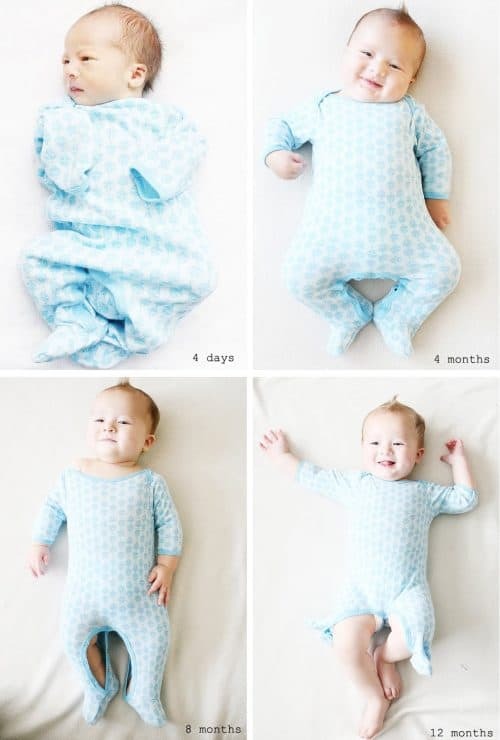 Or, wear the same onesie like this progression series from Erica’s Bloggity Blog. 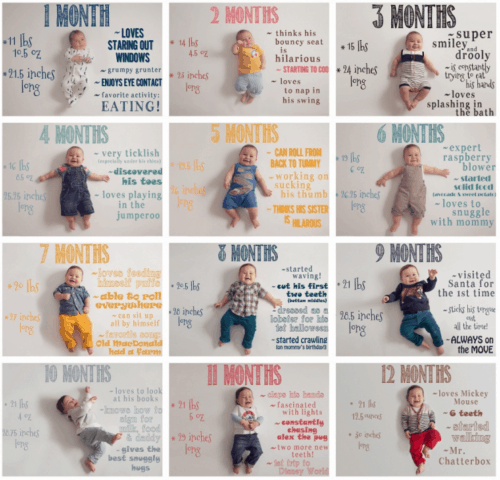 Go gold using bright colors and a fun standout number in this Monthly Baby Milestone Idea from Oh Joy! 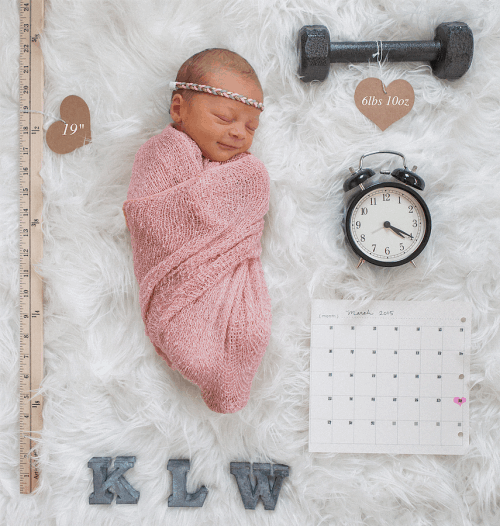 WOW, Tiffany Burke has done an amazing job capturing newborns, but how about this Newborn Announcement would be great incorporated into monthly birth dates. 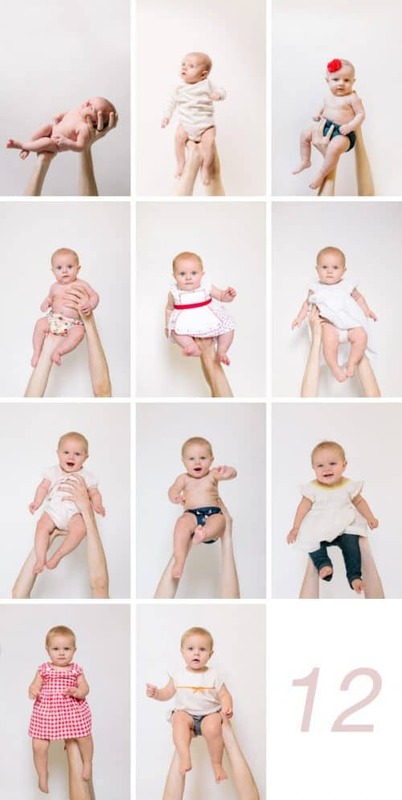 Include mom holding the little one and update the photo with some Descriptive Baby Milestones like this idea from Larissa Another Day. 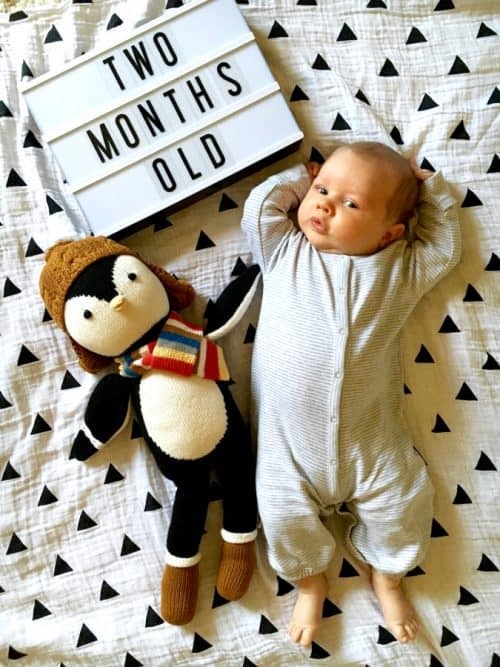 Grab a favorite stuffed animal and keep the background the same like this Monthly Baby Photograph Idea from Kristen Honeycutt. Add color! 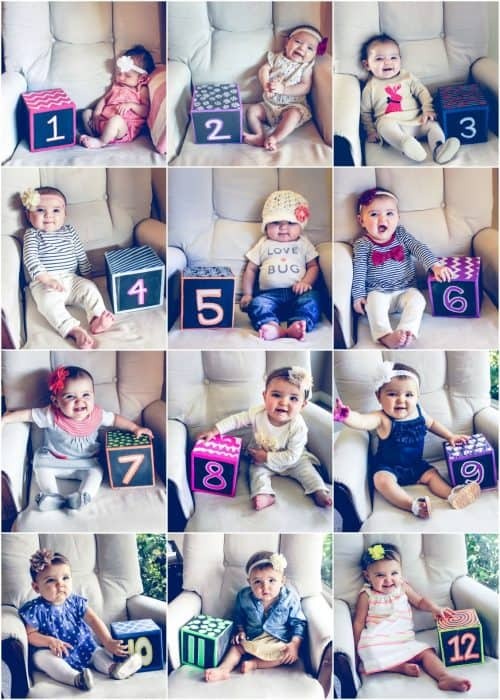 I love these Milestones and Colors brought together from Darling Doodles Design. Additionally, check out Picmonkey to help with your creation. 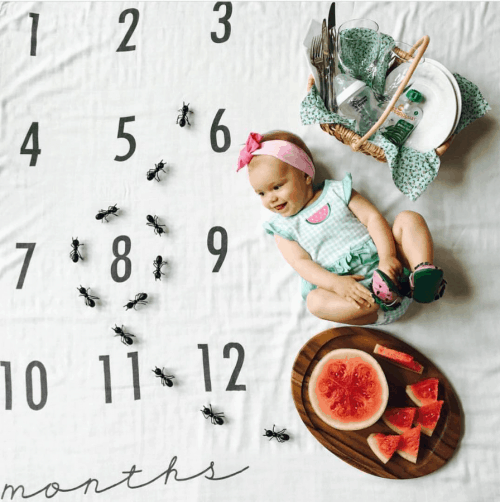 For this monthly milestone progression, lay baby on a calendar each month like Ashley Ann Photography. 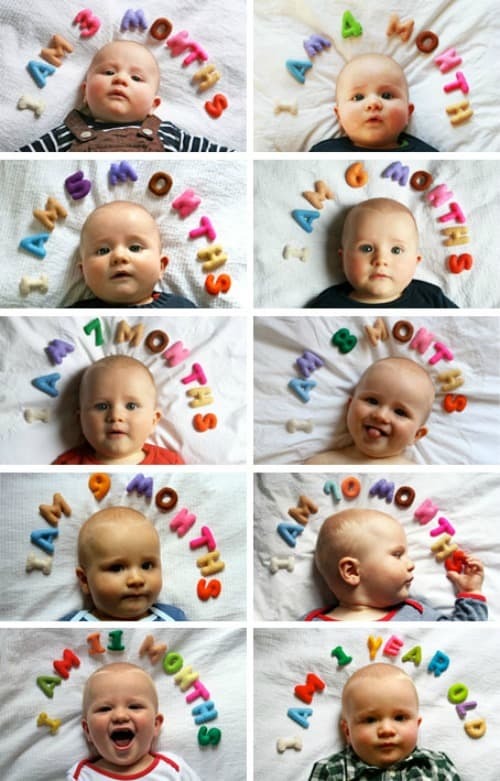 Spell it above with felt letters like this Monthly Photo Idea from Famille Summerbelle. Let a number cube say it all like this Monthly Birthday Photo Series from Hello My Love. 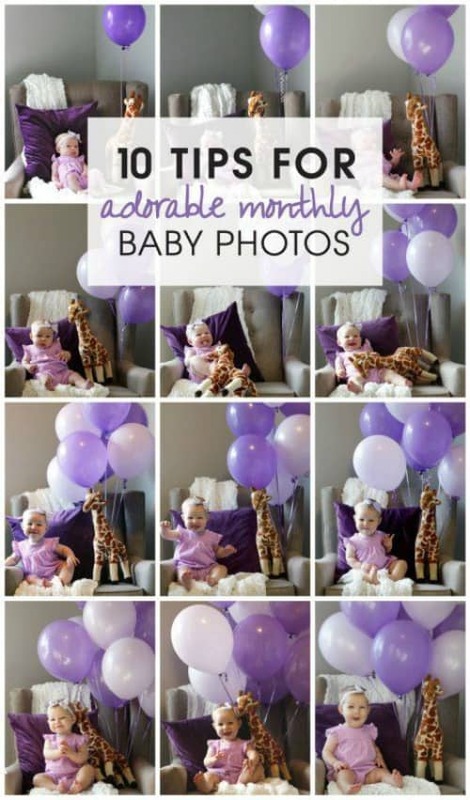 Add Balloons like this 0 to 12 Month Balloon Series Idea from A Crafted Passion. 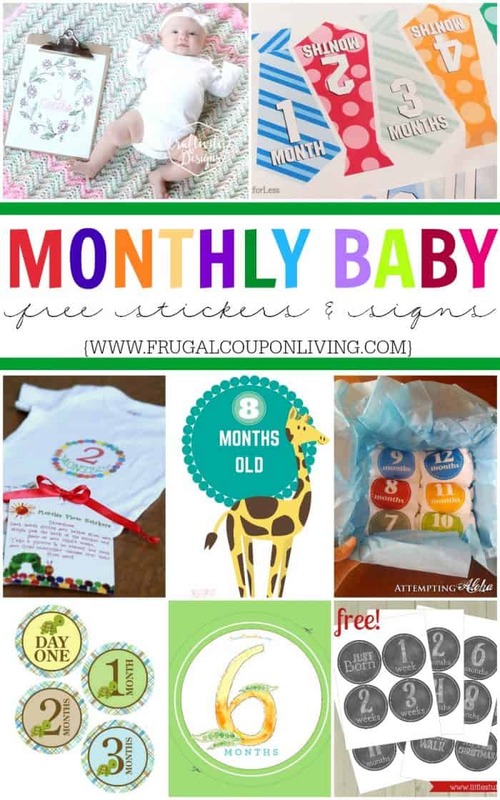 Also take a look at these FREE Monthly Printable Milestone Stickers and Signs. Eric Carle The Very Hungry Caterpillar Inspired Stickers from B is for Boy. Floral and Vine Monthly Photo Signs from Craftivity Designs. Peach and Navy Monthly Stickers from I Heart Arts N Crafts. Brown and Brightly Colored Monthly Signs from Mom and Wife. Pastel and Primary Stickers from Daffodil Design. Chalk Monthly Photo Signs from Reason to Skip the Housework. Solid Boy and Girl Monthly Stickers from Attempting Aloha. Animal, Pandas, or Circus First Year Signs from Phil and Mama. Chalk Monthly Milestone Stickers from Little Stuff. Boy and Girl Monthly Printable Signs from The Frugal Fairy. Necktie Monthly Onesies from How to Nest for Less. Fruit and Vegetable Monthly Photo Signs from Pea to Pumpkin. Turtle Monthly Stickers from Sugar Pickle Designs. Chevron Pink, Blue, and Grey Monthly Signs from Kid Magazine. 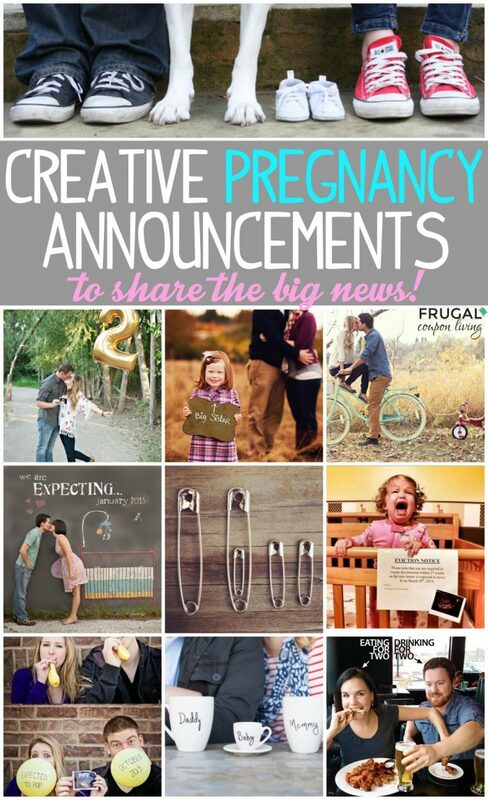 Don’t forget our Creative Pregnancy Announcements. Pin to Pinterest. Also take a look at our popular post – Newborn Tips and Hacks. Pin to Pinterest. Also take a look at these Toddler Tips and Hacks – Tips for new and old moms! Pin to Pinterest.